not to say i found this easy, how to interpret mirror? i helped myself to a little 3w search. 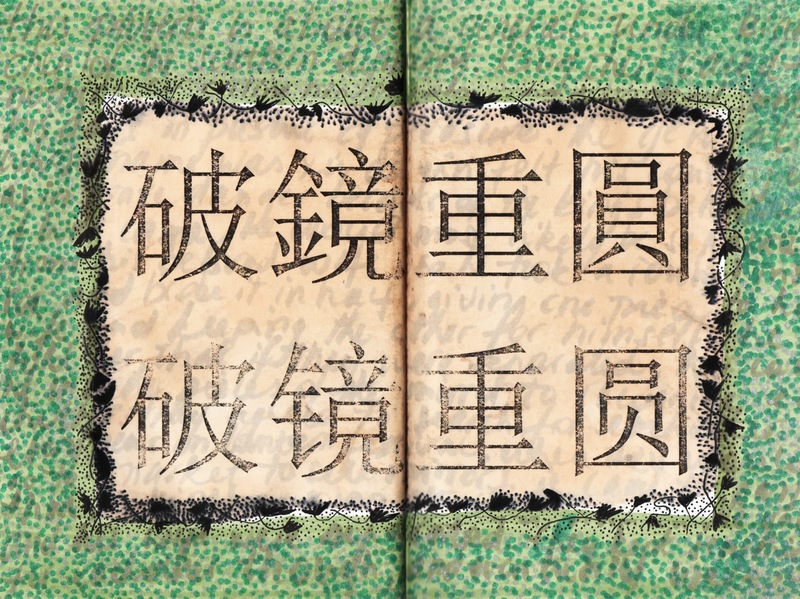 as you can see i decided to play about with chinese fonts, well, with the border more like [no. i did not draw the chinese signs myself. sorry]. read also this accompanying beautiful love story about a mirror. its conclusion is timeless. king chén of the southern dynasty cared nothing for ruling his country, and instead spent his days in pursuit of pleasure. the general, whose name was xú dé yán, felt his country was in grave danger because of the king’s behavior. and if ever war came, he would most likely be separated from his wife. so he took a round mirror and broke it in half, giving one piece to his wife and keeping the other for himself. he told her that if they were separated, they could use the pieces of the mirror to recognize each other. they agreed to search for each other every year on lantern festival, when they would go to the market to sell mirrors. it came to pass that the kingdom was attacked, and xú dé yán and his wife were separated. they kept searching for each other nonetheless, until finally, two broken mirrors reflected exactly what the seekers were looking for, and the general and his loving wife were reunited. this is a new story to me. i am wondering - were the mirror halves magic or were they ordinary objects, but transformed into tokens of hope and persistence so the couple never gave up on searching for each other. Wonderful tale, dear Nadine, and looking at your book pages I can see the level of reflection in the fold of the book. The inspiration for the word 'mirror' came from your place, thank you very much! I love the green dots, they are green like esperance and very springlike. wow nice story, I think the word mirror always allow us to reflect and go in the search of inspiration and recognition..... beautiful chinese signs!!! 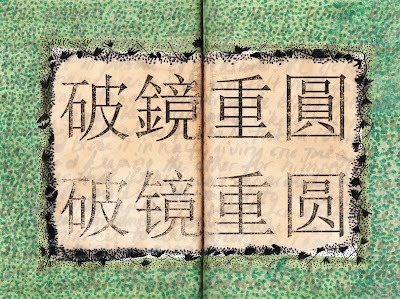 i love these chinese characters, the green, the little leaves bordering, and the tale of lovers reunited. A beautiful story. Awakes inner pictures of those mirrors. Inspiring! Delicate illustration,love the black border against the green and the translucence. There something about a mirror in Merlin and King Arthur legend ... can't remember exactly the details.